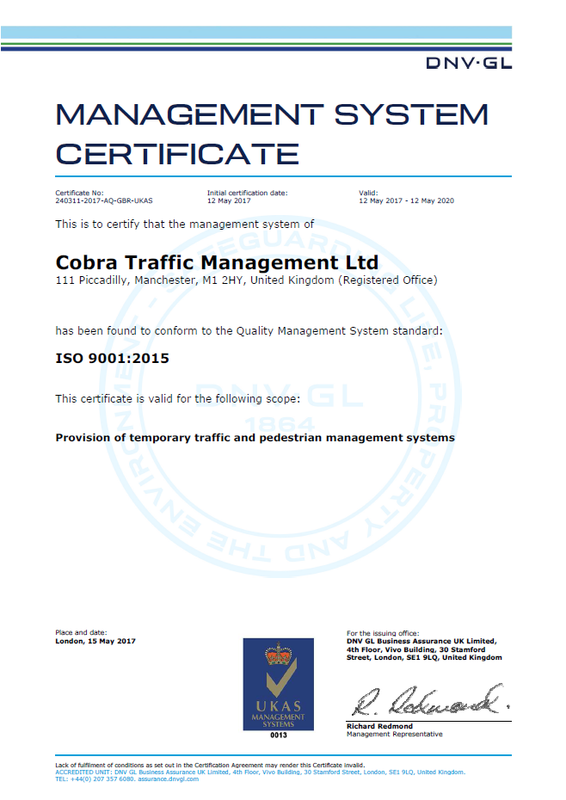 It was a very exciting week for Cobra Traffic Management who has received their certification to the ISO9001:2015 standard. The new standard was introduced in September 2015 and it was always an aim for Cobra to pursue this accreditation. For Cobra, Quality and Safety are of upmost importance and it was vital that we established and implemented a Quality Management System that meets the standards of ISO9001:2015. We are a customer focused business who strives to exceed client expectations. In order to continually improve as a business, we frequently review our management system and seek regular feedback from clients. Our Quality Management System is user friendly and process driven, ensuring a systematic approach to management. We are proud to meet the ISO9001:2015 standard and continue to deliver a high quality service to our clients. If you would like to experience our quality service please contact us at contact@cobratm.co.uk or give us a call on 0844 41 41 444.